19th century toys were simple, and yet they provided entertainment for children in the same way that technical toys do today. There were a variety of toys that children played with throughout the 1800s. Generally these collectible toys were targeted at either boys or girls, items that would encourage strong gender identification. Dolls have been a part of little girls' lives since ancient times. Little girls often had their first sewing experiences creating dresses, hats, and quilts for them. Some of the earliest were carved of wood and dressed in scraps of cloth. The most common dolls throughout the 19th century were homemade cloth dolls. These were often made from scraps of fabric, with embroidered or button eyes. They might have been stuffed with feathers, cotton, or even straw. Manufactured dolls might be stuffed with sawdust as well. Manufacturers made dolls with china or wax heads and limbs. These were expensive and generally were owned by children whose parents were more well off. Celluloid and plastic dolls, which were much less expensive, were not generally available until the 1920s. 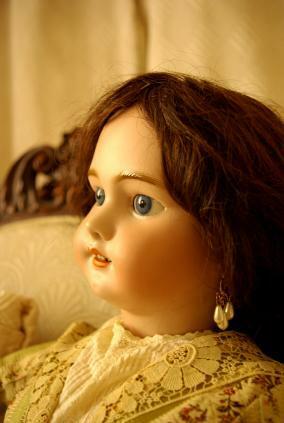 You can see antique dolls of many types at Norma's Antique and Collectible Dolls. Blocks were a common 19th century toy. Then, like now, children could create bridges, houses, forts, and castles as their imaginations dictated. Blocks are one of the few toys from this time period that were not considered gender specific - they were played with by both boys and girls. While some of the manufactured, more expensive blocks may be stamped with pictures or the letters of the alphabet, most blocks were homemade from scraps of wood and quite plain. Children often enjoyed a game of marbles at recess, and many of these marbles are sought after by collectors today.The earliest marbles were made from clay, stones, nuts, china, or agate but they were no match for the handmade glass shooters that some children had. You can see some examples of the beautiful marbles from the 19th century at Collectible Marbles. Graces was a game played mostly by girls in the 19th century. It consisted of hoops, often decorated with ribbons, and catching sticks. Each child would have two catching sticks. The hoops would be tossed from one child to another, using the sticks to toss and catch. The winner would be the one that caught the most times without dropping it. Up until the 20th century most people observed Sundays as a day of rest and quiet contemplation. Children were not permitted to play active games or anything that would be considered worldly. They might sit and read the Bible, look at religious picture books or play quietly with a Noah's Ark. Based on the biblical account of the flood, Noah's Ark toys were often homemade. The animals and people may have been painted or just carved. Some were very intricate. Since these items were made out of wood and quite sturdy many of them are still in existence today. The sets would be made of one Ark that held the various pieces, at least two human figures, and several pairs of animals. It also always had a dove. Although the yo-yo has been popular since the ancient times of the Romans and Greeks, it did not become well known in the United States until the middle decades of the 1800s. People began to create yo-yos of all types and from different materials. It wasn't until Duncan introduced their version of the yo-yo in the 1920s however that the yo-yo became widely popular. There are ten grades that can be given to an antique toy, from mint condition down to "what was that?". Most toys won't be found in mint condition. Since toys are meant to be played with they tend to have more apparent wear than other items. Most antique toys will be found in the middle grades, with noticeable wear but no repairs, or well done repairs. Collectors look for a grade six; anything lower than that is not very easy to display. If you are interested in other 19th century toys and vintage toys from many eras you might be interested in visiting Antique Toy Collections. There are images of many different types of toys, including some of those discussed here.